My second-grade class was a test market for Model Magic. I grew up taking school field trips to the original Crayola Experience, when it was called The Crayola Factory and shared space downtown with the National Canal Museum. The real factory, where the crayons are made, is a short trip up Bushkill Drive, where Crayola began in 1903. It launched with one product: the original box of eight crayons. Through the century of growth since that time, Crayola has kept its offices in Easton, Pa., a far-satellite city of Philadelphia and the only place you can have the true, first Crayola Experience. But it’s not the newest. And it’s no longer the only. Kelly-Anne Suarez is the assistant manager of communications for Crayola Experience, a two-story department store-size playground comprising 70,000 square feet inside the Florida Mall on the city’s south side. A graduate of the University of Florida, she works at the Crayola Experience headquarters in Easton. Over the phone, she prepares me for the Orlando experience with enthusiastic descriptions of the attractions I can expect. Her favorite is an attraction called “Crayon Factory,” in which audience members watch a dramatic demonstration of how crayons are made. The “Crayonologist,” as the performer is called, shares the stage with two comedic counterparts, life-size digital cartoon crayons. 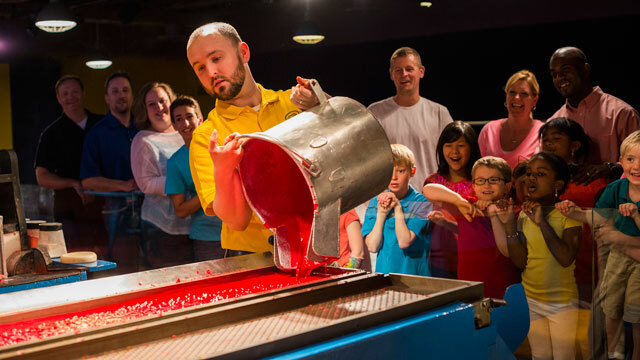 The Crayon Factory features the resident Crayonologist explaining the magic behind crayon making and performing a demonstration. Here he pours a bucket of melted wax into a mold. 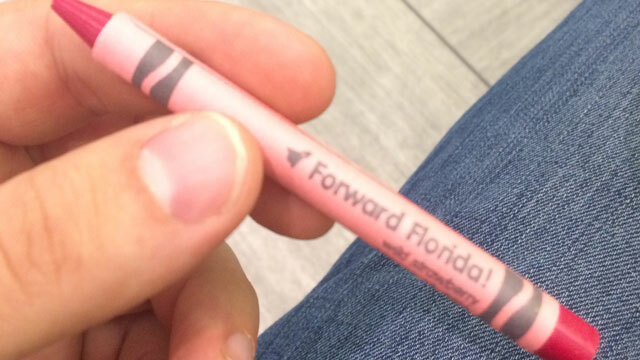 Photo courtesy of Crayola LLC, used with permission. According to Victoria Lozano, senior vice president and general manager of Crayola Attractions and Retail, Crayola didn’t build Experience Orlando for tourists. Rather, it was designed with local families in mind. The majority of guests are Central Florida residents. What seems counterintuitive has proven successful. Since opening last July, Crayola Experience Orlando has made a significant impact on the greater Orlando economy. The attraction has drawn hundreds of thousands of visitors to the Florida Mall and is staffed by 25 full-time employees, who are supported by as many as 250 part-time and seasonal workers. The Experience is a multimillion-dollar investment. Creative play is big business. Crayola Experience Orlando is accessible and affordable, with day passes priced at $22.99; for $12 more visitors can buy a one-year pass, a nice incentive to make playing there a year-round event for parents and children. Its design is an open floor plan that’s lined with 25 “attractions” — stations where visitors are encouraged to be imaginative in new ways with Crayola products; some are familiar, some ultra-new. 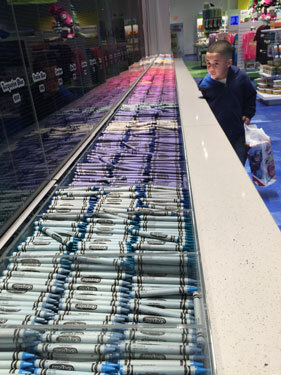 A child in awe of the 40-foot “Pick Your Pack” wall, a special attraction where guests can choose from 99 of Crayola’s most popular colors for their own crayon pack. Jackie Vasquez, marketing and sales manager in Orlando, who has been there since the opening, is my guide. I wait for her in the storefront gift shop, an experience in its own right that might be mistaken for the Experience itself on the first visit. I wander behind the aisles and along the hundreds of thousands of crayons in color-sorted rows that stretch across the back wall, forming columns and color swatches. She greets me at the edge of the wall near the Experience entrance and directs me to follow her outside. “Look at this!” she says, spreading her arms wide to showcase the quarter mile of Florida Mall’s exterior façade that is splashed in familiar green and yellow, a bursting giant box of 64. Cartoon brand mascots wreak playful, creative havoc on the drab gray-tan concrete sidewalk. “It’s impossible to be upset walking in here,” Vasquez says. The Experience in Orlando is a natural extension of the Crayola brand, which employs 1,400 in the Easton area plus has locations worldwide. 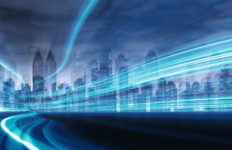 On average, the company brings 200 new products to market each year, which result in 35 percent of total sales. Crayola’s innovation process involves some very thoughtful creativity in conducting market research and product development. “Innovation starts in the home,” Lozano says. Crayola employees are encouraged to take what they’re working on home with them, and see how their children react and immerse themselves into the creative experience. What began as informal product testing with fun and familiar audiences has turned into something more important: family time. “Creative play is an important part of childhood learning and development. 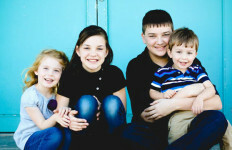 It is also a common bond and shared experience that brings families closer together,” Lozano comments. The Crayola Experience is a manifestation of the company’s mission to raise creatively alive children and allow them to experience the brands products and technologies in a larger than life way. The first attraction visible to anyone entering the Orlando Experience is a proud signature of both the Easton and Orlando locations. The “Wrap It Up” attraction allows guests to create their own unique Crayola crayon. “Wrap It Up” is Vasquez’s favorite attraction, a kiosk where guests can customize their own crayons by selecting and naming their own color on a touch screen, then receiving a naked crayon and applying their personalized custom-printed wrapper. And voila, a new crayon! We move quickly from labeling our individual crayons to seeing how they’re all made in the Crayon Factory, Suarez’s favorite attraction. Vasquez and I sit in the back of a small theater on level bleachers, watching as the “Crayonologist” transitions paraffin wax and color pigment through the stages of becoming a crayon. Scarlet and Turk, the red and turquoise digital crayon sidekicks, crack jokes throughout the process. 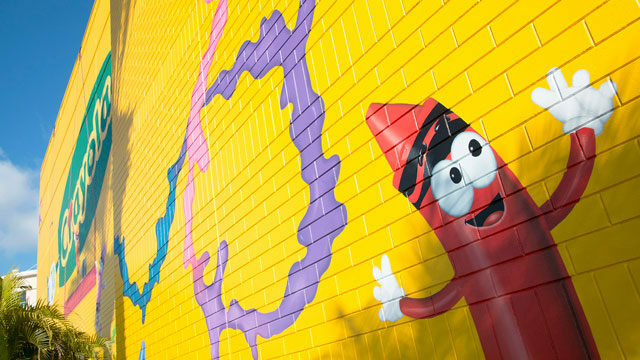 Wrap It Up and Crayon Factory are crayon-centric, year-round signature attractions in both locations. Many attraction crafts change regularly, making each visit a unique experience. The Crayola Experience Orlando itself is distinct from its model and inspiration. Instead of recreating the original, it’s an evolving concept of the brand’s vision of creativity. A few more unique attractions make use of Crayola products — some traditional and familiar, others more futuristic. At one, I melt red and blue crayons onto a sheet of thick card stock that’s fixed to a spinning platform. As it spins, the wax shapes like a flywheel. When the wax cools, the spinning slows to reveal a dramatic wax circle in abstract relief. At another, I melt hot wax again, this time into a mold that forms a shark-shaped crayon. A different station holds a stack of individual coloring sheet outlines of fantasy characters and crayons to color them in with, set in front of glowing-ready computer screens. After some furious coloring, Vasquez shows me how to hold my creation in front of the screen, which captures my Minotaur and forms him to my scribbled specifications, then animates him in 4-D.
Close by, I select a coloring book outline of a stylish man dressed in all white. I color his outfit in reds and blues and hold my sketch to the screen capture. A larger screen displays a model strutting down the runway in the outfit I’ve just designed. “We’re integrating technology into the Crayola brand in some really cool, innovative ways,” Vasquez says. Lozano concedes that her daughter has hit the jackpot: a steady supply of Crayola products and all the creative support she can ask for. Still, it’s not important to Lozano that her daughter becomes an artist. What is important, she says, is that her daughter is prepared to address challenges she encounters with creativity. “Crayola does not manufacture art supplies,” she cites. “We make tools to help children learn to solve problems creatively. Through my tour of the Orlando Experience, I see several families actively engaged with attractions, and with each other. Having created so many new jobs in Orlando, perhaps the ultimate compliment the brand has paid the region is one job it stole away. The current general manager of the flagship Easton Experience is an Orlando transplant. The brand’s vision is preparing today’s children to apply creativity in their lives, wherever it may take them. You might say it makes for incredibly bright futures. Photo Credit: Top image courtesy of Crayola LLC, used with permission. Danko is a proud son of Easton, Pa. living in Tavares, Fla. A graduate of the University of North Carolina at Chapel Hill’s School of Journalism & Mass Communication, he has a decade of diverse experience in advertising, writing and related fields.